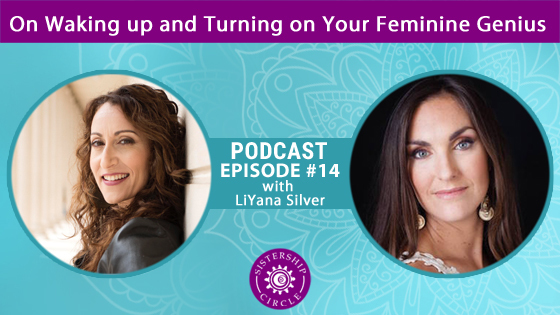 LiYana Silver mentors women to unlock their Feminine Genius. LiYana writes, teaches, coaches, and speaks, helping women to wake up their inner Oracles, turn on their feminine strengths, and live brilliant lives aligned with their true desires. LiYana’s system of Body-Based Leadership supports entrepreneurs, activists, coaches, and change-makers to “get ahead without just using their heads,” and to create sustainable, ceiling-defying results using intuition (before reasoning), feeling (before thinking), receiving (before giving), sensuality (before willpower), pleasure (before restriction), and collaboration (before competition). LiYana’s offerings include private coaching, her mentorship program Woman: The Embodiment Experience, her online course Ignite Your Feminine Genius, and her newest book, Feminine Genius: The Provocative Path to Waking Up and Turning On the Wisdom of Being a Woman. LiYana is a torch-holder for a world-to-be in which the epidemic of women self-haters has long become absurd and feminine leadership flourishes. She also dances, paints in oils, and makes home with her husband and son.